Hercules Pieterszoon Seghers or Segers (c. 1589 – c. 1638) was a Dutch painter and printmaker of the Dutch Golden Age. He was "the most inspired, experimental and original landscapist" of his period and an even more innovative printmaker. Hercules was born in Haarlem, as the son of a Mennonite cloth merchant, originally from Flanders, who moved to Amsterdam in 1596. There Hercules was apprenticed to the leading Flemish landscapist of the day Gillis van Coninxloo, but his apprenticeship was presumably cut short by Coninxloo's death in 1606. Seghers and his father bought a number of his works at the auction of the studio contents, as Pieter Lastman did. Seghers' father died in 1612, after which he returned to Haarlem, joining the Haarlem Guild of St. Luke. He returned to Amsterdam in 1614 to obtain custody of an illegitimate daughter, and the following year married Anneke van der Brugghen from Antwerp, who was sixteen years older than he was. In 1620 he bought a large house in the Jordaan on the Lindengracht for about 4,000 guilders, but by the late 1620s he was in debt, and in 1631 had to sell it. From his studio at the top of the house, which was pulled down in 1912, he had a view on the recently finished Noorderkerk which is on one of his etchings. In the same year he moved to Utrecht and started to sell art. In 1633 he moved to the Hague. He appears to have died by 1638, when a Cornelia de Witte is mentioned as widow of a "Hercules Pieterz.". Like much of the detailed documentation of Segher's life, this link depends on the assumed rarity of his first name. 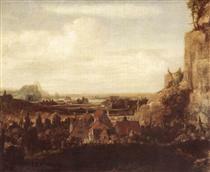 Some later sources said that Segers took to drink towards the end of his life and died after falling down the stairs. 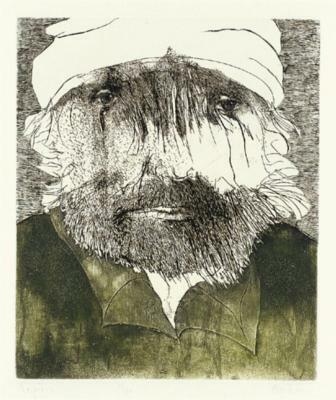 He is mainly known for his highly innovative etchings, mostly of landscapes, which were often printed on coloured paper or cloth, and with coloured ink, and hand-coloured and often hand-cropped to different sizes. He also made use of drypoint and a form of aquatint as well as other effects, such as running coarse cloth through the press with the print, for a mottled effect. Altogether only 183 known impressions survive from all his fifty-four plates and most are now in museums; the Rijksmuseum print room has easily the best collection. Rembrandt collected both paintings (he had eight) and prints by Seghers, and acquired one of his original plates, Tobias and the Angel (HB 1), which he reworked into his own Flight into Egypt (B 56), keeping much of the landscape. 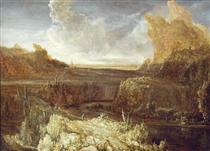 Rembrandt also reworked the Seghers painting Mountain Landscape, now in the Uffizi, and his landscape style shows some influence from Seghers. 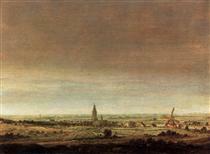 Although the dating of his prints remains unclear, his Town with four towers (HB 29) is believed both to be one of the later prints and, by comparison with paintings, to date from around 1631. Given the small number of surviving impressions, it is unlikely that prints were a major source of income for him. His Pile of books (see Rijksmuseum link) is an unusual still-life subject for a 17th-century print. 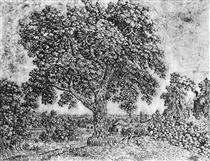 The Great Tree Hercules Seghers ? Mountain valley Hercules Seghers ? 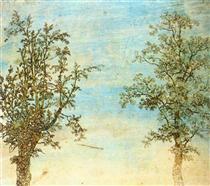 Landscape with overhanging fir Hercules Seghers ? 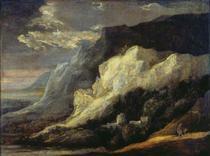 Mountainous landscape Hercules Seghers ? 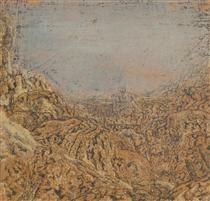 Rocky landscape Hercules Seghers ?